There are so many ways the word "father" is used in Scripture, but the most important way is to refer to God as our Father. In this lesson we explore God as our Father through a epistle of Ephesians. Don't miss the blessing of having God as your Father! What does a sausage biscuit have to do with Sovereignty? Sovereignty is the "rule of God." We love the concept, but we often don't like the ingredients or how it's made. But God really does reign and in this lesson we consider his qualifications to rule as the Sovereign God. Sometimes words lose meaning. When is the last time you really considered what the word "crucify" entails? 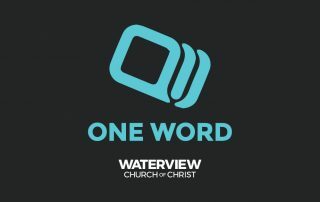 This lesson explores how we should understand this word as it impacted Christ, the first century world and God's plan of salvation for us. Understanding atonement through separation, substitution, and sacrifice. The Word “propitiation” is an unusual word and typically an unused word, except in religious circles. In this lesson we explore what the Bible says about this wonderful concept. The secular world misunderstands the “why” of the crucifixion. Why did Jesus have to die? It has to do with our sin when it enters the purity of God. God must make us “right” because no one…no one…is right. We attempt to be good, but never good enough. Those who experience justification also knows how to respond to that justification. In the Bible, "guilt" is a judicial status within a particular legal framework. That legal framework is being in violation of God's will. Worry is a human problem! Jesus said the only part of creation that worries is us. In the Sermon on the Mount, Jesus outlines five problems with worry and gives one simple remedy for it. We will never reach our world with "truth" until we understand the way our world views "truth." Explore the attitudes some have about the truth and then learn the right attitude we need to have about the truth and most importantly, what is truth and where it can be found.